Cooking is easy. All you’ve gotta do is jump in the kitchen and follow the recipe step by step. A little salt here, dice finely and set the oven to 350°. I try my hand at it every so often and my creations are amazing. Alright, so that’s not true. I don’t and they’re not. Cooking well is an art form as recipes don't always go the way you expect and it takes skill, practice, ingenuity and creativity to react to cooking’s mini-disasters and flip them into something even better than it would have been had things gone smoothly. There’s a certain joy to figuring out the puzzle of a good recipe, and while I may never feel it in reality, Overcooked! 2 is there to turn cooking into a Michelin Star game I can enjoy. The concept of the game is simple. In each level, you’re tasked with combining and cooking sets of ingredients, plating them and then sending them out to be served. My only experience with a professional kitchen is watching Top Chef, but I guess it seems pretty accurate to how things work anywhere. At least, it does until you start cooking on rafts, in kitchens divided by conveyor belts, on moving trucks and inside a hot air balloon. 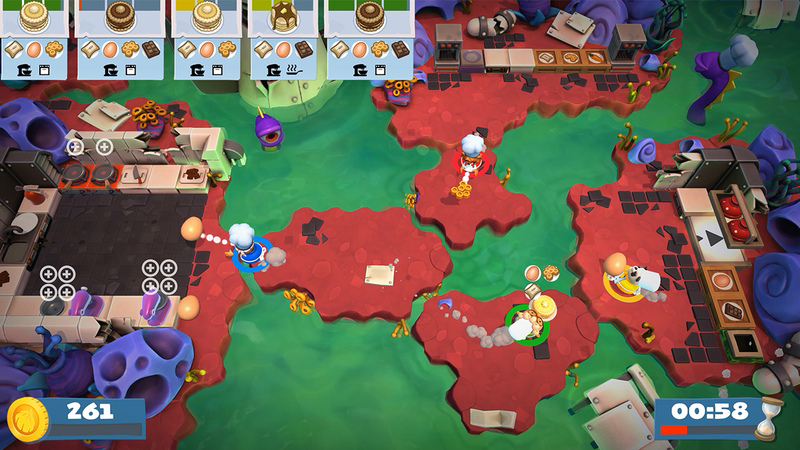 These levels take the simplicity of cutting, cooking, combining and plating and obliterate it, replacing the simplicity with a dire need for complex strategy. Oh, and you’ll probably need a friend. Let’s be clear, while cooking in reality can be done alone and, considering I’m often sent out of the kitchen for being in the way, often is best done alone, Overcooked! 2 is a game for friends. The levels are designed in such a way that it’s possible, but only barely, to achieve your goals alone. It’s much better to jump into a level with a friend, fail as you figure out what’s going on, develop a strategy, get into a fight when that strategy falls apart, and then ultimately come together for a resounding victory. Overcooked! has been designed from the ground up as a co-op experience first and the level design shines for it, with each player taking on certain tasks depending on the level but all players remain dependent on the others to get things done quickly and efficiently enough. And you will need a strategy, because each level functions basically as a puzzle when you first see it. There are a variety of different recipes — some favorites from the first game as well as a few new ones to mix it up. Each of these requires different steps and cooking hardware to prepare and things move quickly, so you’ll need to figure out who’s doing what and then execute it perfectly. This alone is harder than it sounds and requires a bit of practice as a team to get to a point where you can trust each other to do what needs to be done. Once you’ve got it down, wrenches are thrown in regularly as pieces of the levels will move and change. In one level, you might have to have one player throw raw veggies to another over an uncrossable, moving gap. Another player then cuts those veggies and throws them back to be cooked. In another, conveyor belts will constantly change direction. In yet another, fires will appear and block your path so that you must choose between taking the time to get a fire extinguisher or going around if that’s even an option (or waiting for your friend to put the fire out for you, lest you miss delivery on the recipe you’ve been preparing. Like the original game, every level is different, offering a new challenge to overcome through discussion, teamwork and execution. It’s a recipe that just works wonderfully. The first game is known for being strikingly difficult. Overcooked! 2 follows in its footsteps as you’d expect, though it might be a bit easier — having just finished the first game with my wife earlier this year, we moved through this game much faster but that could be down to experience more than a new design philosophy on difficulty by the developers. Either way, the last several levels are as difficult and rewarding as you’d hope. You’ll need to work for those three stars in each level, but they won't ever feel impossible to achieve. For those new to the series, you’ll be pleased to learn the game is easy to learn and difficult to master. My wife is not a gamer, but she was able to adapt to the game quickly, learning how to move her character through the isometric levels while executing complex actions. It’s a perfect entry point to gaming while still being deeply enjoyable for those who’ve been playing for ages, which is an accomplishment all of its own, and quite a rare one too. The biggest complaint for the first game was undoubtedly the lack of online multiplayer. Players not lucky enough to have someone willing to sit through the game with them were stuck trying to go it alone in what was probably a long and frustrating experience. That will no longer be a problem as Overcooked! 2 features online play in every aspect. 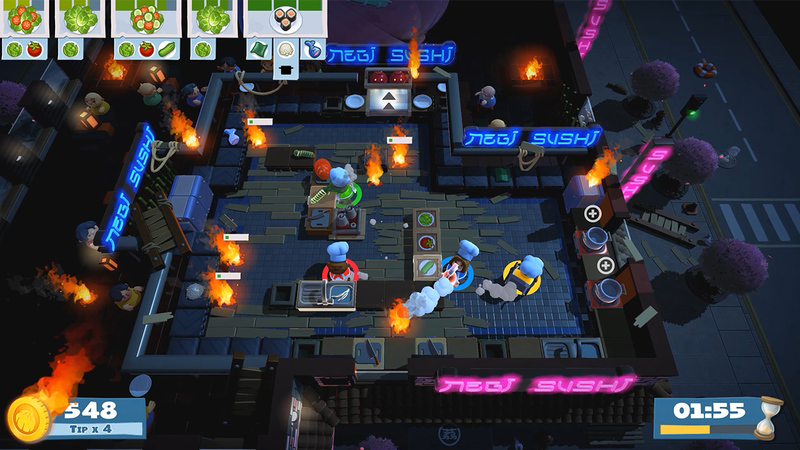 The full story mode can be played co-op, as well as random arcade levels. You can also compete against other players in online versus mode. I wasn’t able to find a match as this was a pre-release copy, but we did test local versus mode and you’ll be happy to hear it’s the same idea as the traditional gameplay with you simply competing against the opponent’s score. You can bet I’ll be there as soon as the game’s out to test my skills against others online. 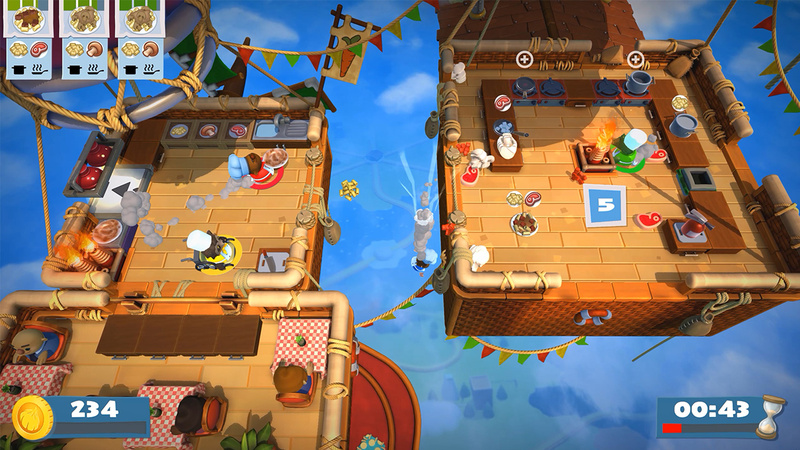 As for complaints with Overcooked! 2, they are few and far between. Gone are the levels that made it extremely hard to move, frustrating players inexperienced with console gaming, and with online play available, all of the major issues with the first game have been remedied. Only one major new problem popped up when I was playing and that has to do with colors. While most levels were fine, a few were very difficult simply because ingredients would blend in with the background. In a game where precision and speed are equally important, confusion as to where the ingredients are is a big problem. My wife was especially troubled by this, but I had issues as well so it’s not down to just one person not getting it. This issue can be overcome with experience in a level to the point that you always know where everything is, but that doesn’t make failing because you couldn’t find a bun against the backdrop any less frustrating. The achievements will primarily see you dipping your feet into versus mode and then playing through the story with the goal of three-starring all the levels, including the bonus levels. Those bonus levels are unlocked by completing hidden objectives in specific levels (I’m not sure what they all are, but I unlocked quite a few by accident and there’ll no doubt soon be a guide). Then you’ll simply have a bit of grinding to wrap up everything that didn’t come with natural progression, like delivering a set number of orders. The most frustrating part will be that only player one will get any progress toward any achievements just like the first game. My wife played with me every step of the way and came away with 0 Gamerscore while I earned quite a bit. This means you’ll be doing everything twice if you play with a buddy who loves achievements. I wasn’t able to test if online play remedies this or if versus play counts credit for all players. Still, it shouldn’t be an overly difficult completion so long as you can find a co-op partner. Overcooked! 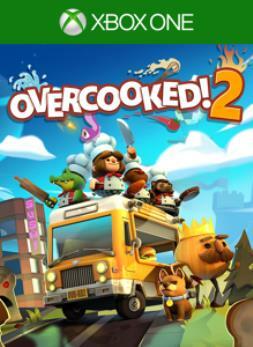 2 is a Michelin Star game. As a co-op experience, there are few games better at bringing together players of different skill levels for some fun. Each level is thoughtfully designed with co-op in mind, offering a depth of challenge and strategy that makes beating a level very rewarding while also still being accessible to those who don’t often play games. The sheer variety keeps things fresh and online play allows you to experience the game as it was meant even when you don’t have someone playing right next to you. If you want a fun game you can pick up and play with a friend, kid, sibling or significant other any time, there are few alternatives that could offer a better experience. Overcooked! 2 was prepared perfectly, and you’ll love every bite. 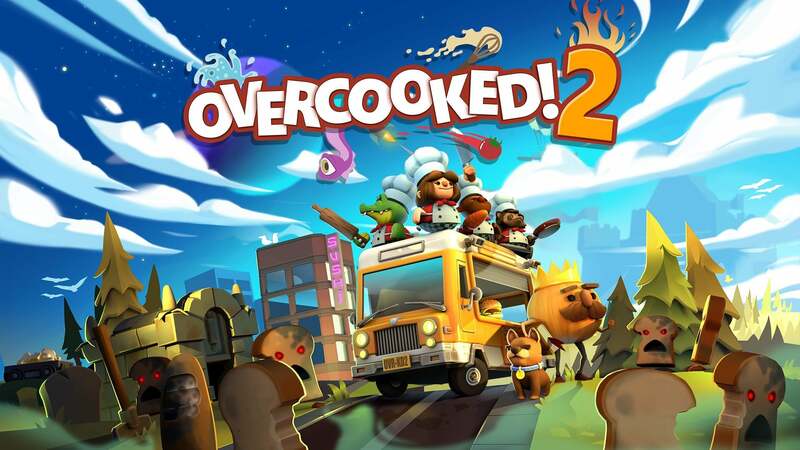 The reviewer spent approximately five hours trying to cook meals quickly using perfect strategies he cooked up with his co-op partner, unlocking 8 out of 26 achievements for 265 Gamerscore. A download code was provided by the publisher for the purpose of this review. Kevin is a lover of all types of media, especially any type of long form story. The American equivalent of Aristotle, he'll write about anything and everything and you'll usually see him as the purveyor of news, reviews and the occasional op-ed. He's happy with any game that's not point and click or puzzling, but would always rather be outdoors in nature.